Hillary Chybinski: 4 months. 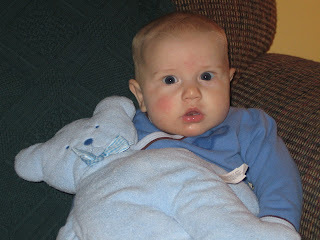 . .
. . .so owen is four months old today. i feel as if we have turned a corner. . .and honestly, not a moment too soon. things have been tense here to say the least. most of it my personal obsessions with neat, tidy orderly and timely. i'm sure i drive my family crazy, but i can't help it. and my aggrevation is increased by incessant crying (owen) and whining (ryan). i resolved to breathe and relax for 2007. . .but so far, no dice. but when i look at the angelic faces of those i hold so dearly, i see that i need to - for them - for me. . .relax.